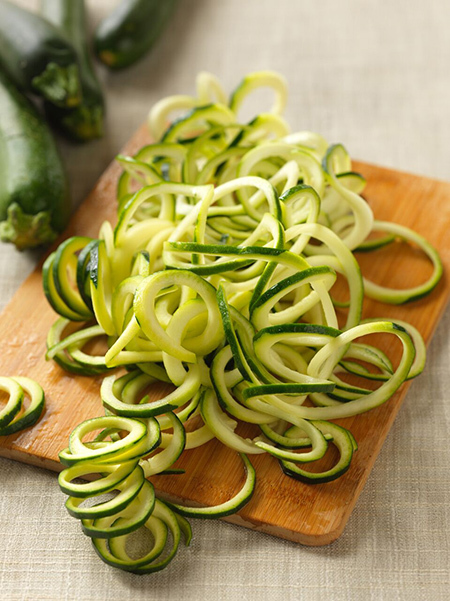 Zucchini Romesco counts “zoodles,” or zucchini noodles, among its ingredients. Despite posting decreases in systemwide same-store sales and revenue, Noodles & Company is seeing momentum as it heads into the summer months, executives told investors on Thursday. For the first quarter ended April 3, total revenue decreased 5.3 percent, to $110.5 million. Systemwide same-store sales fell 0.2 percent, which the company attributed to harsh weather in February and a shift in the Easter holiday. Noodles & Company posted a $3.6 million net loss for the quarter, compared with a loss of $26.8 million the previous year. Last year’s plummet was tied to one-time charges related to the closure of 55 underperforming locations. CEO Dave Boennighausen said same-store sales have been trending upward since March. He projected comparable sales to swing positive for the second quarter, ranging between 1 percent and 3 percent. The projections are based on new initiatives to drive sales and repeat visits, including the recent introduction of “zoodles,” or zucchini noodles (left). The new product is featured in two entrées: Zucchini Romesco and Zucchini Thai Green Curry with Shrimp. If you’re counting, a regular bowl contains 11 grams of carbs and 60 calories. Boennighausen said the low-carb product addresses a major challenge for the Broomfield, Colo.-based chain: the veto vote. In the past, some consumers have passed on dining at the carb-heavy brand because it lacked a low-carb, low-calorie option. During its trial phase, which occurred over nine months, Boennighausen said zoodles helped drive repeat business. Still, he told investors it was too early say what impact zoodles are having on sales. During the quarter, Boennighausen said the company completed the installation of quick pick-up shelves at restaurants nationwide. The shelving adds convenience for customers fetching online orders. He said the company is also close to cutting a deal with third-party delivery operators, which will result in half of the chain’s restaurants offering delivery. Currently, delivery is only available at 15 percent of Noodles & Company locations. Breaking down same-store sales, franchised locations posted a 0.9-percent increase, while company-owned units saw sales decrease 0.3 percent. At the end of the quarter, Noodles & Company had 476 restaurants. Of those, 411 units are company-owned, and the rest are franchised. Noodles & Company plans to make an announcement soon on the hiring of a new CFO, Boennighausen said.